Activities that require repetitive jumping like basketball or volleyball can lead to tendinitis in the patellar (tendon) ligament, also referred to as jumper’s knee. The force placed on the tendon over time can lead to inflammation and pain. The pain is generally felt just below the knee cap. 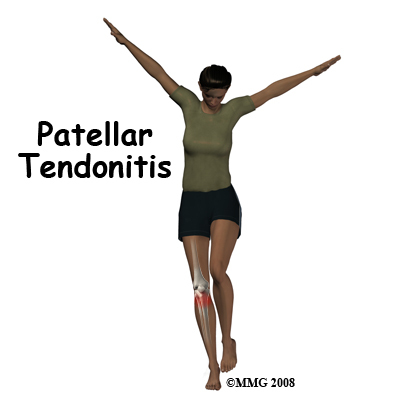 Patellar tendinitis affects the teno-osseous junctions of the quadriceps tendon as it attaches to the superior pole (extremity) of the patella, and the patellar (tendon) ligament as it attached to the inferior pole of the patella and the tibial tuberosity. Pain is concentrated on the patellar (tendon) ligament, but can also occur at the insertion of the patellar (tendon) ligament into the tibial tuberosity. The patellar (tendon) ligament is involved in extending the lower leg, but is also the first area to experience shock when landing from a jump. It is forced to stretch as the quadriceps contracts to slow down the flexion of the knee. This repetitive stress can lead to minor trauma in the tendon, which will lead to inflammation. Repetitive flexing and extending of the knee also places stress on this tendon if the tendon does not travel in the required path. Repetitive jumping and landing activities. Running and kicking activities. Untreated minor injury to the patellar tendon. Pain and inflammation of the patellar tendon, especially from repetitive or eccentric knee extension activity or kneeling. Swelling and tenderness around the tendon. As with most tendinitis, inflammation that is left untreated will cause addtional irritation, which causes more inflammation, setting up a vicious cycle. This can eventually lead to a rupture of the tendon. Damage to surrounding tissue may also occur. Stretching the quadriceps, hamstrings and calves will help relieve pressure on the patellar tendon. During rehabilitation it is important to identify the conditions that caused the injury in teh first place. Thorough warm-up and proper conditioning can help prevent the onset of this condition. A support strap placed below the knee may be needed at first to support the tendon during the initial return to activity. Prevention of this condition requires strong quadriceps and a good strength balance between the muscles that surround the knee. Complete recovery without lingering effects can be expected with good treatment. Occasionally, it may return due to a weakened tendon, especially in older athletes. Call (+65) 64712 674 (24 Hour) for Appointment today to treat your Patellar Tendinitis Today.